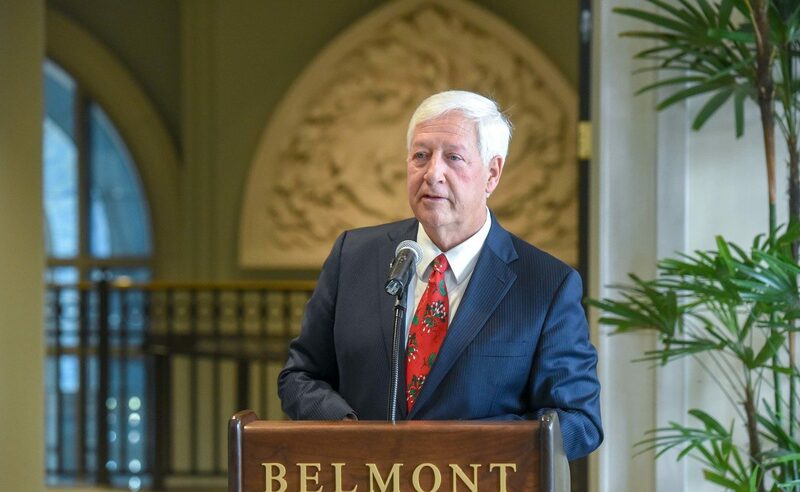 Dr. Bob Fisher announces the Frederick Hart Collection at Belmont University in Nashville, Tennessee, December 5, 2018. Belmont University announced today the May 2019 opening of the Frederick Hart Collection, a permanent museum and repository of Hart’s work. Bob Chase, Hart’s publisher and president of The Frederick Hart Foundation, and Lindy Lain Hart, the artist’s wife, are donating more than 250 works to Belmont, including completed sculptures, works in various stages of development, molds, plasters, sculpting tools, artifacts and archival material. The new museum will be the largest permanent collection of Hart’s work available for public viewing. In addition, a generous donation of Hart sculptures, including the full size Christ Rising, bronze, has been gifted to the Museum by passionate Hart patrons Lee and Pam Kennedy of Sarasota, Florida. Their timely gift adds to the importance of this undertaking. American master sculptor Frederick Hart (1943-1999) created works that forever changed the national landscape such as Washington National Cathedral’s Creation Sculptures and Three Soldiers bronze at the Vietnam Veterans Memorial. Hart was distinguished as the 2004 recipient of the National Medal of Arts along with other significant commissions, awards and achievements during his lifetime. His sculptural work was critically acclaimed as traditional in its adherence to the human figure, radical in its sensuality and innovative in its materials. Belmont’s relationship with Hart’s work dates back nearly two decades. In 2002, Ex Nihilo, Working Model, cast marble (Washington National Cathedral’s Creation Sculptures) was donated to Belmont by long-time University benefactor Barbara Massey Rogers. The work is installed on the south exterior wall of the University’s Chapel, facing the lobby of the Ayers Academic Center. With architect ESa and R.C. Mathews Contractor, Belmont will begin renovations next month to recreate Hart’s working studio and provide display space for the collection. The first floor of the campus’s Lila D. Bunch Library—already home to the prestigious stringed-instrument collection, the Gallery of Iconic Guitars, and the Leu Art Gallery— has been selected as a synergistic location. These unique artistic endeavors will create a dynamic collective to further enhance the student learning experience, attract leading scholars to explore Hart’s artistic contributions and further awareness of Belmont’s pursuit of excellence in the arts. Visitors to the Hart Museum will find they are surrounded by multiple mediums from mere sketches to completed works by Hart. Included will be an extensive presentation on Hart’s innovative use of clear acrylic resin, the medium Hart pioneered to cast figurative forms which he described as “sculpting with light.” This innovation led to a patent for the process to embed one clear acrylic sculpture within another. The museum will also focus on historical and biographical insights into Hart’s life, and experiences that shaped his ideals and his critical positioning of the importance of the human figure in the visual arts. The Museum is, in a very tangible sense, creating a sacred space for the viewer. Formed in 2010, the Frederick Hart Foundation is a non-profit entity with the mission to preserve and perpetuate the ideals set forth by Frederick Hart regarding the ongoing purpose and mission of figurative art, its place within contemporary culture, its need for innovation through new technologies and materials, and its vital role in affirming our society’s ideals of truth, beauty and goodness. For his important body of work—including the Washington National Cathedral’s Creation Sculptures and the Vietnam Veterans Memorial’s Three Soldiers—which heralded a new age for contemporary public art. The work of Frederick Hart is changing the world of art, vindicating the artist’s strong belief that with the new century would come changing tides in the style, form and direction of the arts. Frederick Hart’s sheer virtuosity and talent put him in a category that few recent sculptors have attained….It takes years after an artist is gone to make a definitive judgment of their contributions. But if anyone would make the cut, he should. Although he has stated that innovation is not a priority for him, his pioneering use of Lucite© including a process that he has patented, is evidence that he is not an artist enslaved by the past. I find the Lucite work of particular interest. Hart believed that the cultural tides were changing and that the 21st century would bring a renaissance and an age of enlightenment. He determined to create sculptures that physically and spiritually reflected this and spoke to the transforming power of beauty. It is not surprise that at a time when the art world had largely spurned the human figure, Hart chose to champion it. At certain moments in history, one encounters a work of art that possesses the aesthetic, contextual, and moral strength to signal the start of a new era. The Creation Sculptures is such a work. Within its forms lies the imagery and beauty to spark an American renaissance. It is good to be inspired by art for a change, rather than to look ta art that betrays humanity… Hart’s restoration of the human figure, in all its wholeness and vulnerability. ..is an important moment in the aesthetic and social history of art. (Art) must be an enriching, ennobling and vital partner in the public pursuit of civilization. It should be a majestic presence in everyday life just as it was in the past. My feeling is that the artist’s greatest challenge is to make men see, as if for the first time. To alter and enrich man’s perception and conception of the world and himself. How? By seeing its Truth as it has never been seen before. This is to me the essential purpose and value of art.